The number of US broadband households that do not subscribe to traditional pay TV services has almost tripled in the past five years, according to new research. 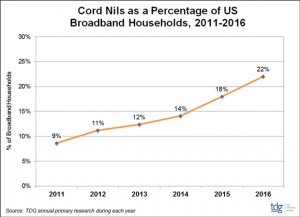 The Diffusion Group (TDG) study claims that the number of ‘cord nils’ – US broadband homes that make zero use of services from cable, satellite, or telco-TV providers – has grown from just under eight million in 2011 to 22 million by year-end 2016. 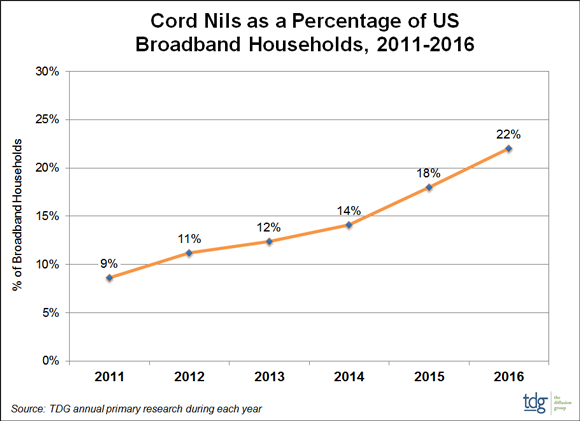 The ‘cord nils’ figure as a proportion of total US broadband households grew from 9% of 85 million US broadband homes in 2011 to 22% of 100 million broadband homes in 2016. TDG’s ‘Life Without Legacy Pay TV: A Profile of US Cord Cutters and Cord Nevers’ report said this represents a 144% increase in the percentage of ‘cord nils’ since 2011 as “the value of broadband/ pay TV bundle erodes”. “Wall Street and the media are myopically focused on the quarterly drip of legacy pay TV subscribers, which unfortunately overlooks a larger and more dangerous trend,” said TDG co-founder and director of research, Michael Greeson. TDG claimed that the extent of the disruption to legacy operators has been largely overlooked, with MVPDs now turning to ‘skinny’ TV services to “save their dual-service relationships”.